The Oklahoma Insurance Department can help Oklahomans with questions about severe weather-related insurance claims. The free help is available by calling 1-800-522-0071. When it comes to insurance, flooding and water damage are not the same thing. Water damage is caused by water that hasn't touched the ground. If snow comes in through a broken window, melts on your floor and ruins your carpet, that's water damage, which is covered by your homeowner’s policy. Damage from a burst pipe or wind-driven rain may also be covered depending on the circumstances of how the damage was caused. The policy does not cover water damage caused by poor home maintenance such as overfilled gutters, neglected roofs, ignored leaks or condensation buildup due to poor ventilation. Insurance policies do not pay for lack of maintenance, faulty workmanship, faulty products or faulty installation. Flood insurance is provided by FEMA’s National Flood Insurance Program. A flood insurance policy covers physical damage to your property and possessions. If you have any other questions about insurance, contact the Oklahoma Insurance Department at 1-800-522-0071 or visit our website atwww.ok.gov/oid. -Freezing conditions such as burst pipes and ice dams; however, there is generally a requirement that the homeowner has taken reasonable steps to keep the house warm. Special note: HO2 policies do not cover for weight of ice and snow. Please review your policy for the weight of ice and snow coverage and if you do not have that coverage, talk to your agent about buying a policy that includes this coverage. Collision coverage of an auto policy covers damages to your vehicle from an accident where the other driver is uninsured, a single-car crash or where you were found to be at fault in the accident. Comprehensive coverage covers damage to your car caused by falling trees or ice, vandalism, theft and flood. Finally, liability insurance pays for the other people’s property and medical bills for vehicle accidents that you had been found at fault in causing. 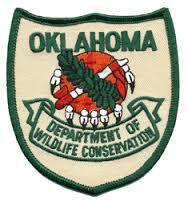 The Oklahoma State Department of Wildlife has added to the Cookson Wildlife Management Area, which is just north of Sequoyah County in Cherokee County. The addition of 180 acres to the area was made with a State Wildlife Grant. The property adds to the management area and links it to a 189 acre unit of the Ozark Plateau National Wildlife Refuge. Through the properties are owned by different agencies, the wildlife department and the U.S. Fish and Wildlife Service, they have similar management goals, officials said. Although the wildlife grants are often awarded to survey or research species in need of conservation, the congressionally-appropriated funds can also be used to purchase lands that provide habitat for these species. Several law enforcement agencies gathered recently at the Sequoyah County Courthouse to set up a Remembrance Tree. This is the fourth year for the Remembrance Tree in Sequoyah County. 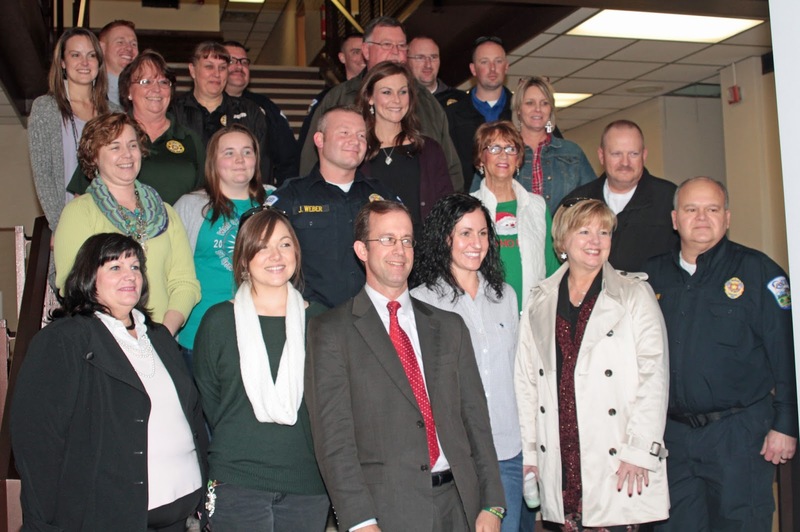 Staff with the Sequoyah County District Attorney’s Office, the Domestic Violence and Sexual Assault Team, the Sallisaw Special Victims Unit and the Sequoyah County Child Abuse Task Force attended the reception held from 2 to 4 Friday. 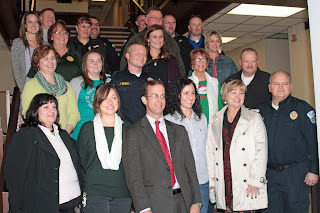 Attending are, above, from the left in the front row, Stacey Slaughter, Ashlee Wing, District Attorney Brian Kuester, Shawna Morris, Debby Keith and Sallisaw Police Chief Terry Franklin. In the second row, from the left, are Margaret Cook, Kelsey (last name unknown), John Weber, Sharon Day and John Owens. In the third row, from the left, are Cindy Smith, Jennifer Griffey and Donna Owens. In the fourth row from the left, are Sunshine Moton, Amy Edwards, Sequoyah County Sheriff Ron Lockhart, and Lance Yoakum. In back, from the left, are Will Cosner, Mark Rutherford, Ben Smith and Charles House. Cindy Smith said Jennifer Griffey and Sunshine Moton organized the event. 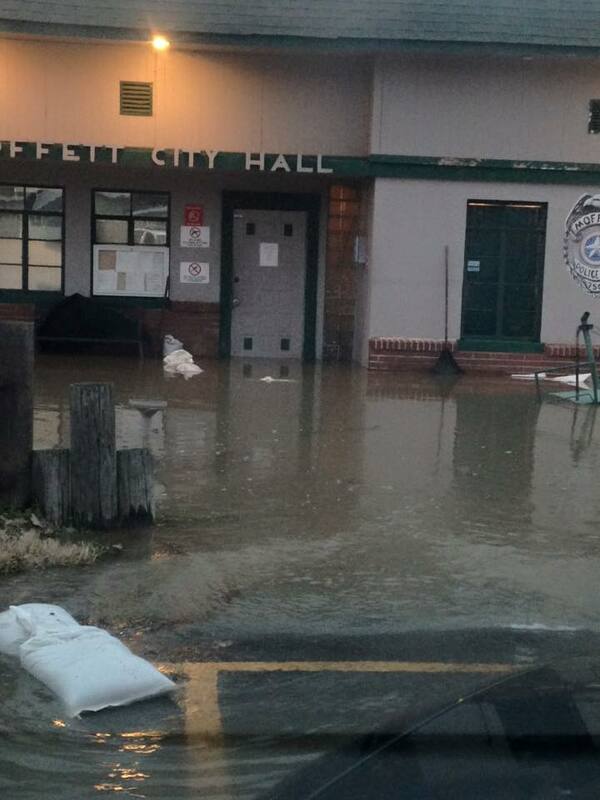 Moffett authorities are working feverishly to save their town as the Arkansas River floods. Moffett Police Chief Riley Brooks said police and firemen are pumping water out of city hall – at 10 a.m. Wednesday – to save city hall, the police department and Mayor Kathy Luper’s office. “We are trying to salvage city hall and our records,” Brooks said. Brooks said help was also going on at Moffett School. Brooks said he was helping School Superintendent Jimmie Owens barricade school buildings with sand bags. He said one building on the school campus was flooded as of Wednesday morning. Most Moffett residents have voluntarily evacuated but a few remain, Brooks said. He said firemen went door to door advising residents to leave. It was not a mandatory evacuation. Brooks said the American Red Cross is helping with the evacuation, especially the elderly, and are providing evacuees with shelter, food and clothing. “The Red Cross is really helping us,” Brooks said. Brooks said authorities had to use innovative techniques to direct water around city hall. Brooks said he wanted the public to know that Moffett government, police and the fire department are “fully functional.”. A man who drove around barricades to cross a flooded road in the Poteau area, then had to be rescued when his truck stalled on Monday, was issued a ticket, the Oklahoma Highway Patrol reported. The Pocola Fire Department’s swift water rescue team helped save the man whose truck flooded on Old State Highway 112 at James Fork Creek. The road was closed due to flooding. In Sequoyah County, Sheriff Ron Lockhart said several swift water rescues have been successful, including three on Sunday alone, due to flooding caused by record-breaking rainfall. The Lake Tenkiller dam is releasing a record amount of water, a spokesman for the U.S. 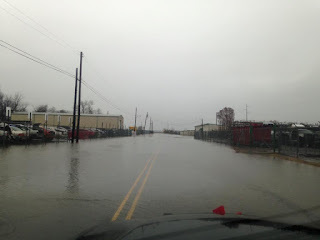 Corps of Engineers said Tuesday. 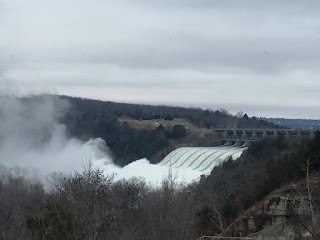 The 62-year-old flood control reservoir was releasing 35,000 cubic feet per second while trying to control the record-breaking rainfall that fell on the area over the Christmas holiday. Brannen Parrish, U.S. Corps of Engineers Tulsa District spokesman, said the lake is at 665.9 feet, as of 1 p.m. Tuesday, which is 33 feet above its normal elevation at 632 feet. The record high level at Lake Tenkiller was 666.36 feet earlier this year. Parrish said it was predicted the lake would reach 666.8 feet by Tuesday, which would set a new record level, but that had not occurred as of 1 p.m.
“Lake Tenkiller is about 99 percent full,” Parrish said, “but all we can do is make predictions.” And predictions can change due to a number of factors. Parrish said not only is the Illinois River flowing into Lake Tenkiller, but the runoff from the hilly terrain and the watershed area around the lake is also headed for Tenkiller. Consequently, the lake level is continuing to rise. 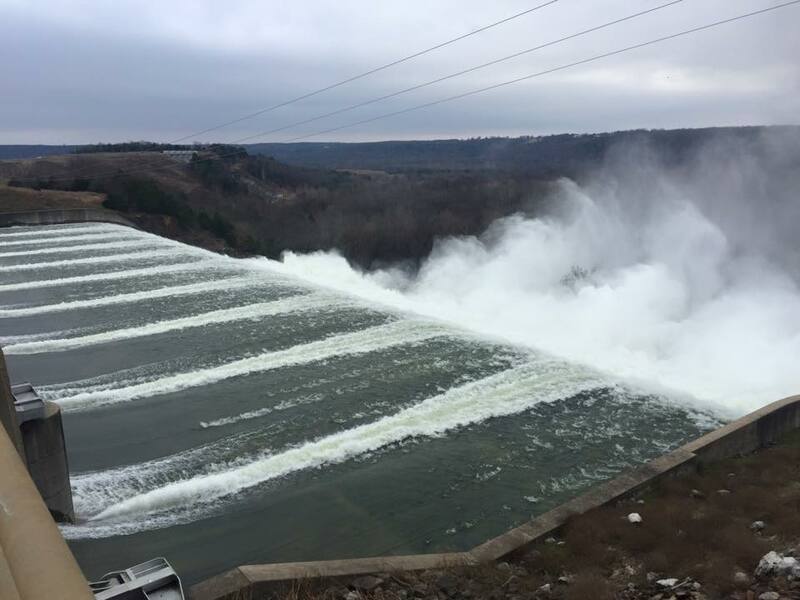 Parrish pointed out that Kerr Lake, which is 1.6 feet above normal and holding steady as of Tuesday, is not a flood-control lake and what flows in pretty much flows out at the Robert S. Kerr Lock and Dam south of Sallisaw. 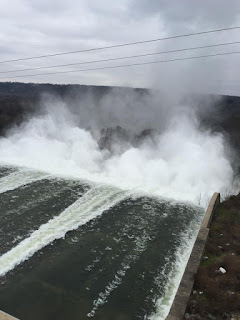 That dam was releasing 325,900 cubic feet per second (CFS) as a 1 p.m. Tuesday. The incoming flow was at 353,000 CFS, Parrish said. The Webbers Falls Lock and Dam was releasing 345,000 CFS. Both are considered part of the navigation system, not part of flood control. Parrish explained that engineers are trying to hold back as much water as possible at Tenkiller to control flooding downstream. Darryl Wayne McGowin, 32, of Gore, was killed Sunday after he reportedly drove around crossing gates and onto train tracks at Gore, Muskogee County Sheriff Charles Pearson said. 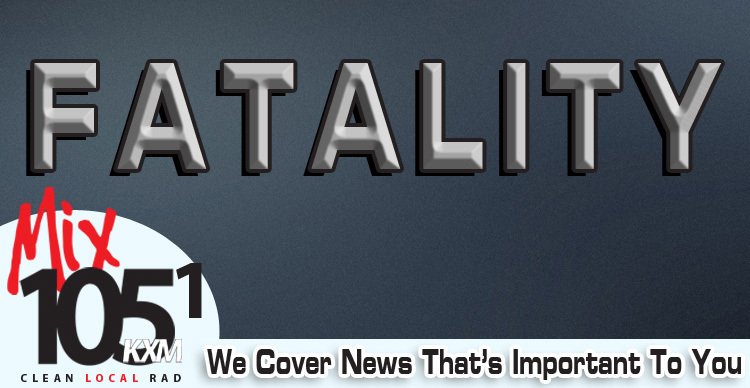 The crash was reported to have occurred in Muskogee County. Pearson said high flood water caused rescue personnel to have to detour through Webbers Falls to get to the scene. The Union Pacific crew members on board the train were not injured, a spokesman said, and the scene was cleared by about 10 a.m. Sunday. The National Weather Service extended the flood warning for Sequoyah County and the general area at 11:30 a.m. Tuesday as heavy rains continue to cause streams and rivers, including the Arkansas and Illinois Rivers, to rise. The Town of Moffett in eastern Sequoyah County, and on the Arkansas River bank, experienced heavy flooding Monday (pictured above) causing many residents to evacuate voluntarily. Many residents are continuing to evacuate although it is not mandatory at this time. All thru traffic is being diverted from the town. Steve Rutherford stated, "The Arkansas River is continuing to rise steadily." -MarVal Trout Camp is closed due to flooding on the Illinois River. The camp was evacuated Monday. -Highway 101, near the state line, is open but is being monitored. Rutherford said swift water rescue teams were sent out on three rescues over the past 24 hours, but some of those trapped abandoned their vehicles and walked out on foot. Rutherford said the teams were sent to a rescue at 5 a.m. Monday on Cosner Road, but the person was rescued by the Roland Police Department. Other rescues in the same area were conducted earlier Tuesday and on Monday. McKey Fire Department called for assistance from Sallisaw Fire Department at about 3:30 p.m. Monday. The fire was at a home on Dwight Mission Road, south of U.S. Highway 64, and was extinguished by the time the firefighters arrived. Little damage was reported. A rear-end crash on Cherokee Street, near the intersection with Choctaw in Sallisaw, resulted in one person transported to an area hospital. Police said the person may have suffered neck and back injuries. 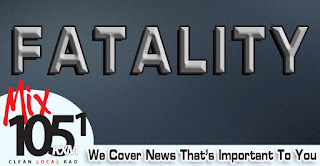 The crash occurred at about 3:30 p.m. Monday, and Sallisaw Fire Department rescue personnel responded and helped stabilize and remove the injured from the vehicle, which was struck in the rear by a van. 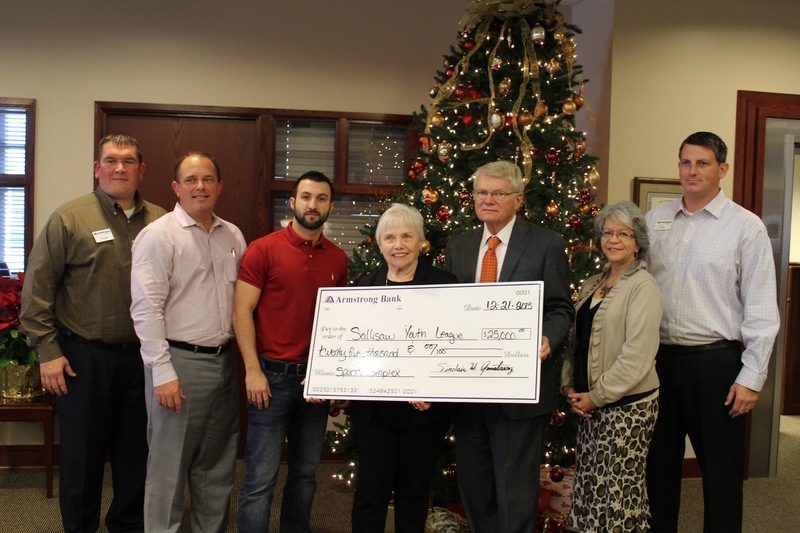 The Sallisaw Youth Sports Complex received a gift from Armstrong Bank Thursday – a $25,000 donation. 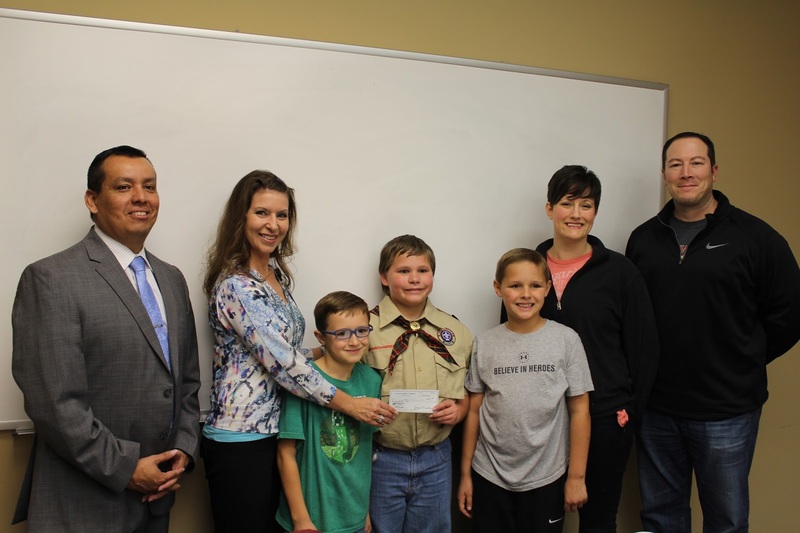 At the presentation are, from the left, Treye Girdner, market president at Armstrong Bank Muldrow Branch; Todd Martin, Sallisaw Youth League board member; Matt Merrill, Youth League treasurer and board member; Ann Farmer, bank board member; Dr. Sinclair Armstrong; Terri Daniels, Armstrong Bank SVP; and Eric Riggs, market president at Armstrong Bank Sallisaw Branch. Martin said, “This is a shot in the arm for the sports complex.” The complex is expected to be ready for use in the spring, and Martin said the donation will help with final details. 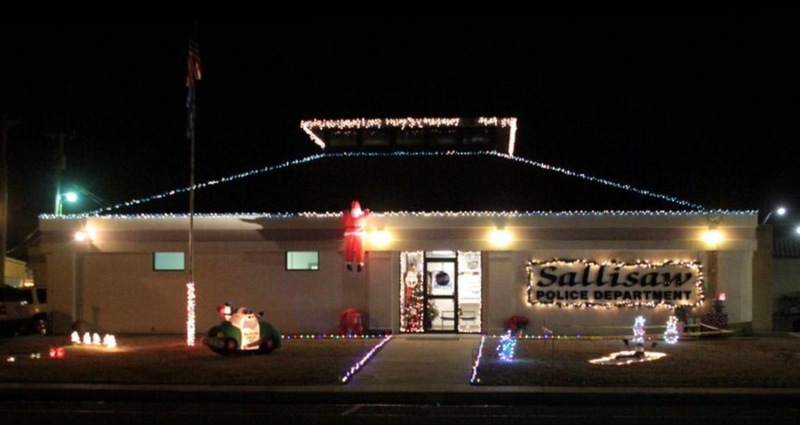 It’s not often a “crime scene” wins a Christmas decoration contest but that’s exactly what the Sallisaw Police Department did this year. The department’s enactment of the “horrendous” murder of Mrs. Frosty tied for first in this year’s Sallisaw Chamber of Commerce Storefront Decoration Contest. Cherokee Nation Career Services also tied for first. Police Chief Terry Franklin said the officers came up with the scenario themselves. The scene depicts a melted Mrs. Frosty, surrounded by crime scene tape, while a Santa imposter attempts to escape by climbing the front of the police department. But someone saw the crime. Those witnesses are the tiny snow people scattered around the front of the building. They quickly call the North Pole Police, who arrive in their own patrol car. The investigation reveals that the meltor, or the murderer, left behind a weapon, a hair dryer that lays besides the pool of, or what is left of, the victim. The North Pole Police call in their best investigator, their P-9, that’s for Pork 9, not K-9, also known as the miniature pig Miss Gizzy. The porker sniffs out the culprit, an imposter Santa Claus who is trying to steal the Christmas gifts. Mrs. Frosty found out Imposter Santa was trying to steal Christmas and he melted her to keep the secret. Even though imposter Santa tried to escape, he was captured and taken into custody. “And Christmas was saved,” Franklin said. Decorations will remain in place until after Christmas for those who still wish to observe the crime scene, and speculate on what crime the police department will have to investigate next year. The Sallisaw School Board agreed last Monday to advertise for bids to demolish the old middle school. 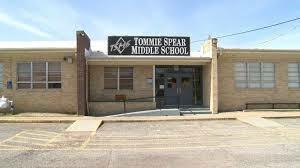 School Superintendent Scott Farmer said tearing down the old school is just one option under consideration. The call for bids is being advertised county-wide for two weeks, and bids are due by 10 a.m. Jan. 29 at the school administration office. For information on the bidding process contact Farmer at 918-775-5544. The bids received will be presented to the school board at their Feb. 8 meeting. 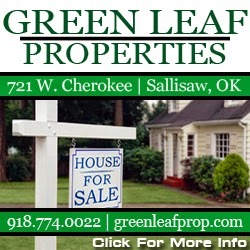 The school board originally offered the property for sale to the City of Sallisaw, but, “A purchase is not on the table at the moment,” Farmer said. The old building itself covers a little over 40,000 square feet, Farmer said, and the property on which it sits is not much bigger. One problem with that site is a portion of it is in the flood plain. Other portions of the old school, a band room and media center not in the flood plain, have been leased to the Sequoyah County Boys and Girls Club, which will occupy those buildings on Jan. 4. The cafeteria is also separate from the old building, and is being used by other groups, and the school system will continue to use the auditorium. Farmer said it is hoped that one of two gymnasiums in the old building can be saved for use by the Boys and Girls Club. “In its current state it can’t be used because of the vandalism,” Farmer said. Vandalism has been an ongoing problem with the property. If a gym can be saved, and the rest of the building removed, Farmer said it hoped the cleared property can be used to benefit the community and its youngsters. The property may perhaps be used as a park, for basketball goals, as a play area or for a splash pad. 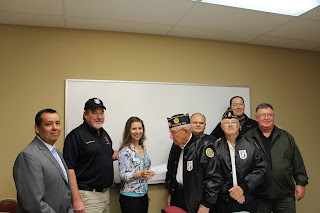 Cherokee Nation officials honored veterans at their tribal meeting last Monday. 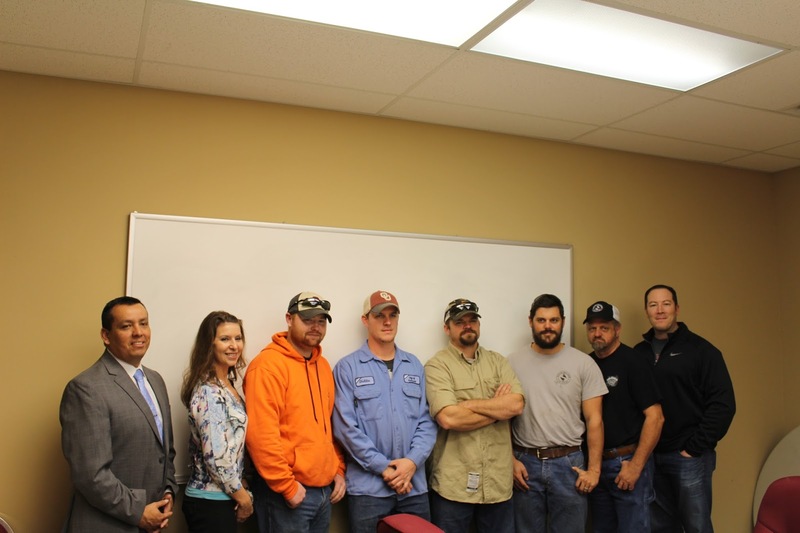 At the meeting are, from the left, Cherokee Nation Deputy Chief S. Joe Crittenden, Tribal Councilor Bryan Warner, Lyndon Emberton, U.S. Army veteran Eugene Emberton of Muldrow, Principal Chief Bill John Baker and Aaron Emberton. 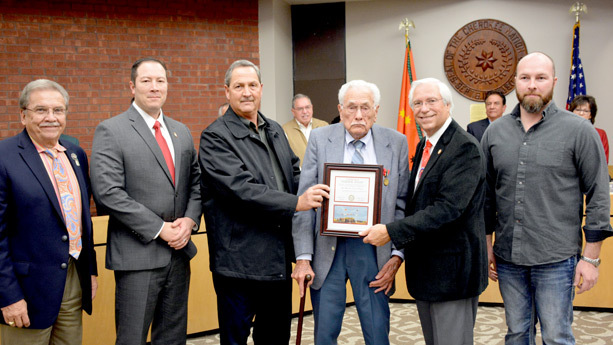 The Cherokee Nation honored a World War II veteran and Korean War veteran with the Medal of Patriotism at last Monday’s Tribal Council meeting. The family of a World War II veteran who passed away last month also accepted a medal on his behalf. Eugene Emberton, 93, of Muldrow, Robert Alberty, 83, of Adair, and the family of the late Mark Cartwright of Pryor received the medal from Cherokee Nation Principal Chief Bill John Baker and Deputy Chief S. Joe Crittenden acknowledging their service to the country. Tec 5 Emberton was born Oct. 19, 1922, in Akins. Emberton was drafted into the U.S. Army in 1943 and was the youngest of four brothers, who all served in World War II. He served in China, India and Burma during the China offensive in central Burma. Emberton’s unit was responsible for building and reconstructing roads and bridges that were needed for advancement on the enemy. After an honorable discharge in 1945, Emberton continued to serve in the Army Reserves until 1952. He earned numerous ribbons and medals for his service, including the Good Conduct Medal, American Theater Ribbon and World War II Victory Ribbon. Airman 1st Class Alberty was born Jan. 1, 1932, in Stilwell. Alberty joined the U.S. Air Force in 1951 and was stationed in Europe for more than two years after completing basic training. In Germany and France, he constructed communication lines for telephones and radios on new fighter bases that the United States was building. Alberty completed the final six months of his service in Dhahran, Saudi Arabia, where he supervised construction crews building communication lines. He received an honorable discharge in 1955 and earned numerous medals and ribbons for his services, including the National Defense Service Medal, Good Conduct Medal and Army Occupation Medal. Carpenter’s Mate 2nd Class Cartwright was born Aug. 2, 1923, in Pryor and joined the U.S. Navy in 1943. Cartwright served as a gunner on a naval combat ship during World War II. He also helped set up bases and prepare the beaches for troops to come ashore, because the ships could not get close enough to de-board due to the coral reefs near the shore. Cartwright received an honorable discharge in 1945. His wife, Mary, and son, Craig, accepted the award on behalf of the family. 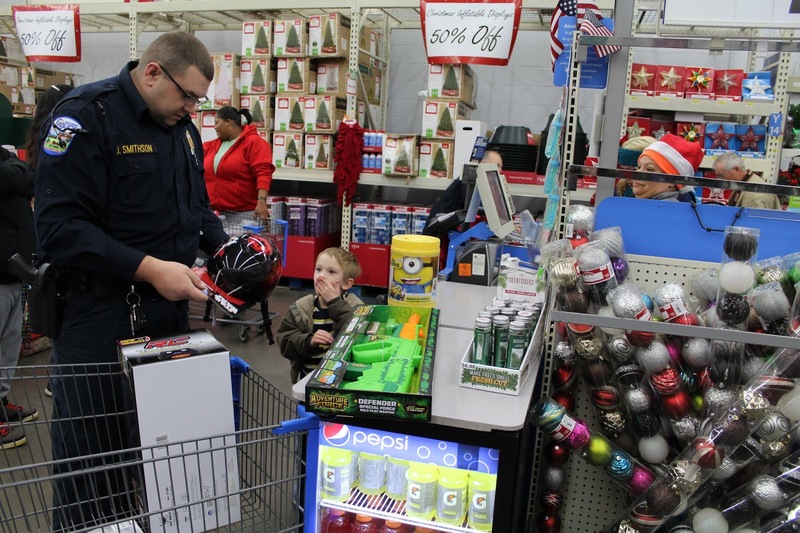 Sallisaw police officers participating in Shop with a Cop. Cops and kids arrive at Walmart. On a trip to delight. 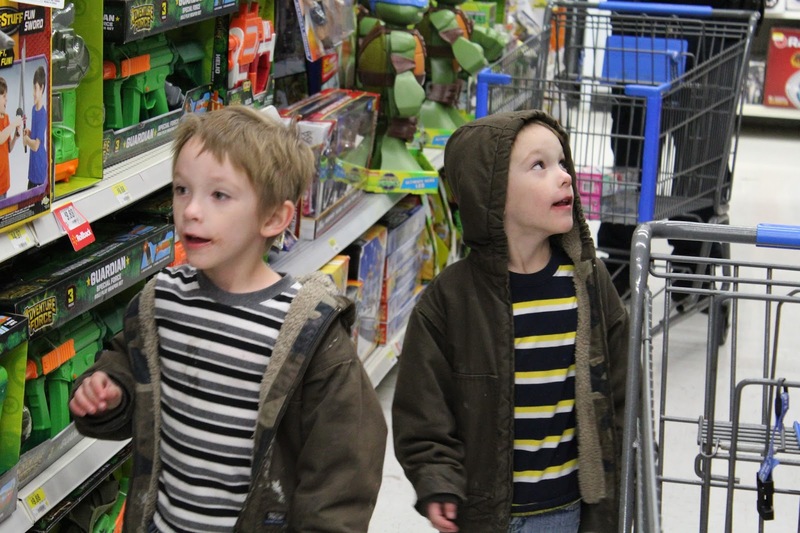 Twins Easton and Evan, age 5, had hard choices to make, and shopped with Officers Justin Smithson and John Owens. 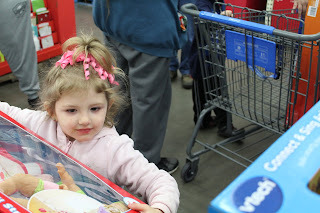 Rosie, age 3, unloads her toys at checkout. She was assisted by Sallisaw Police Chief Terry Franklin. That the cop would fulfill. Officer Justin Smithson considers a helmet for himself but Evan thinks he is taking his! He didn’t. On a cop shopping spree. There were smiles all around. 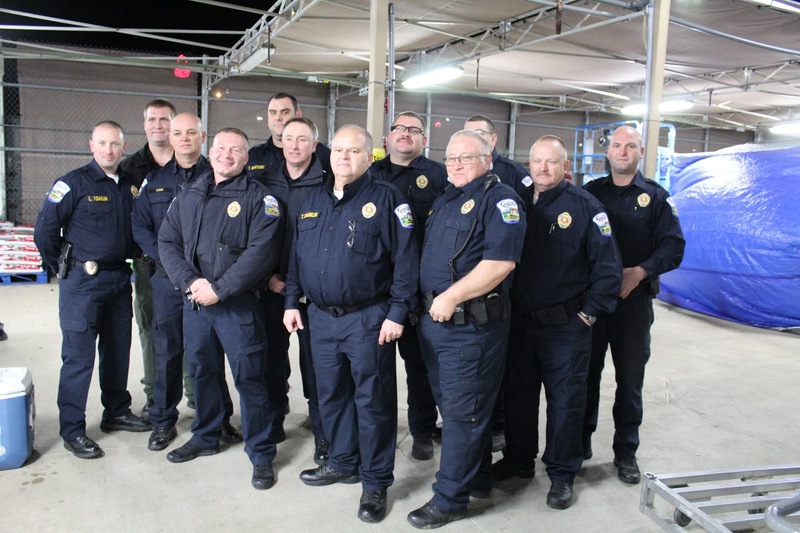 The Sallisaw Police Department and Fraternal Order of Police (FOP) combined efforts Thursday evening in their Shop with a Cop program. 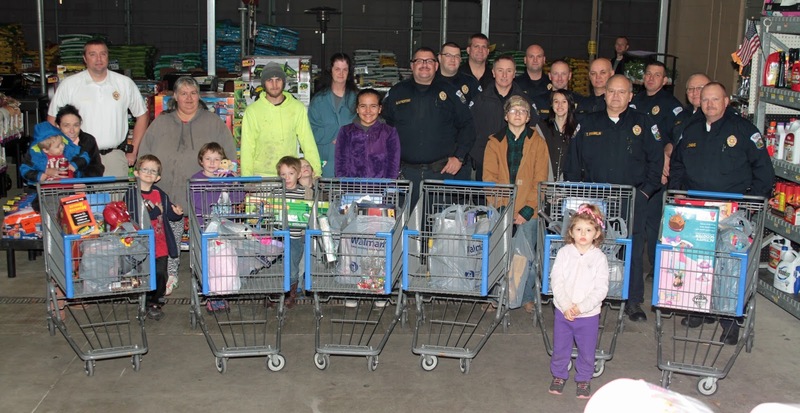 Through fundraising efforts, the police and FOP had $150 for each child to spend on toys for themselves. 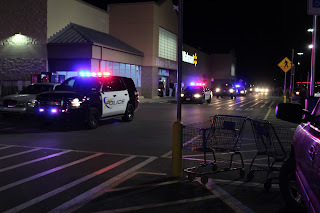 After a thrilling ride from downtown to Walmart in police vehicles, the children were first treated to a hot dog supper and gift bags by Arvest Bank and Walmart. Then the shopping began as each officer assisted a child in choosing Christmas gifts. 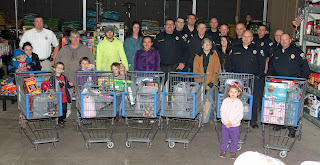 Although the gifts were to be for the child, some children also chose gifts for family members. 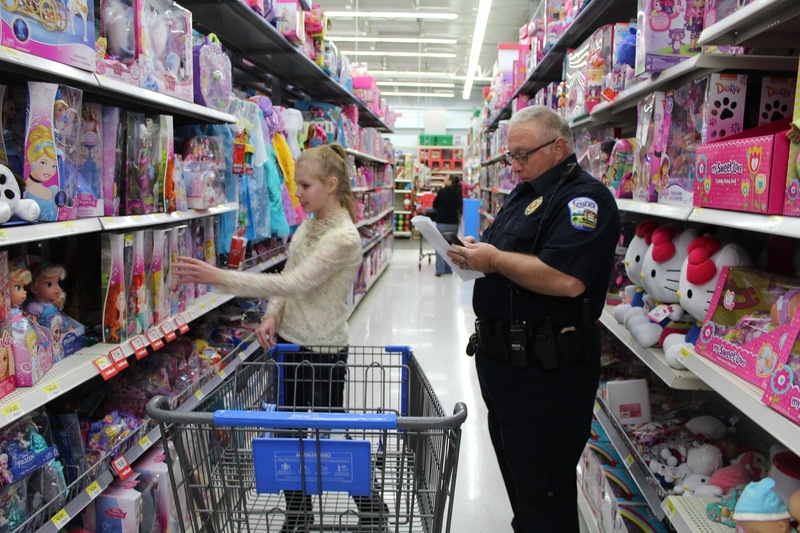 Police Chief Terry Franklin said the Shop with a Cop program in Sallisaw has been ongoing for 12 or 13 years. “All the guys volunteer their time,” he said. 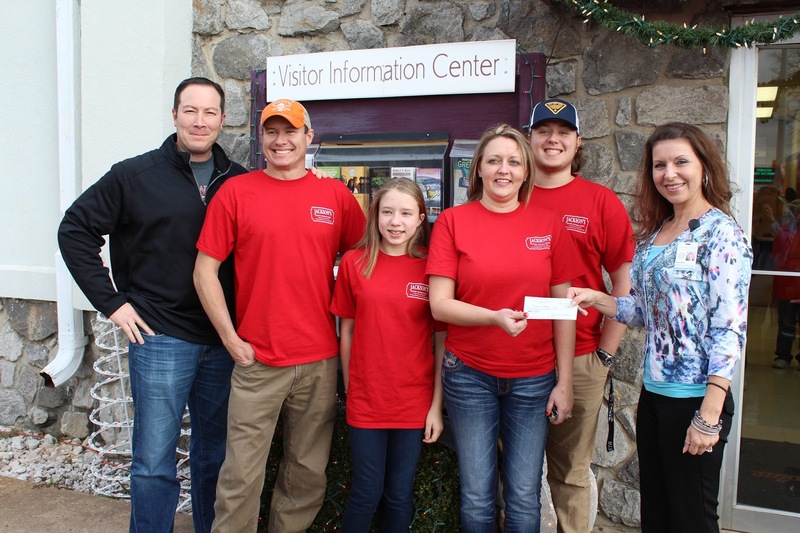 “The money is raised through their fireworks stand and softball tournaments. 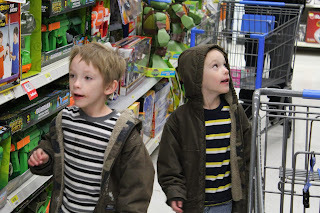 Walmart even forgives the sales tax. “It’s a great program,” Franklin said. Sallisaw Youth Coalition students gathered five baskets of food items and 10 blankets to give to Catholic Charities during the Christmas season. 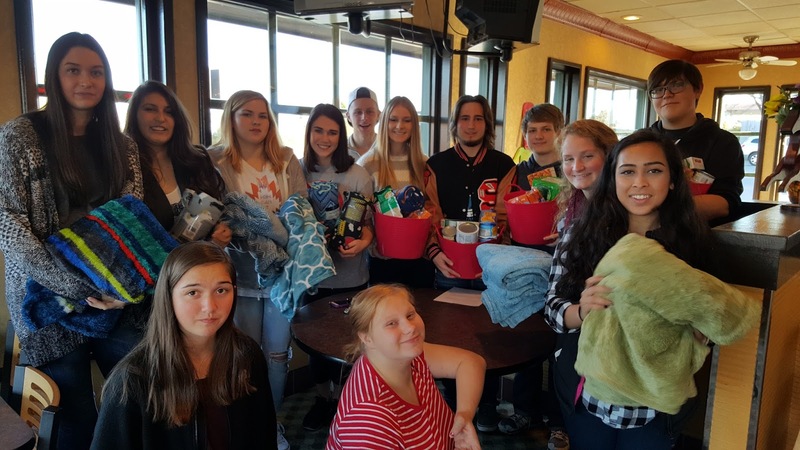 Students working on the project are Whitney Dobbs, Elijah Davis, Katie Raney, Jake Hume, Adyson Holt, Madison Huff, Matt Pence, Nirali Jayswal, Jenna King, Logan Babb, Taylor Valdivia, Gracie Taliafero, Shandra Batemon and Kade Mendiola. 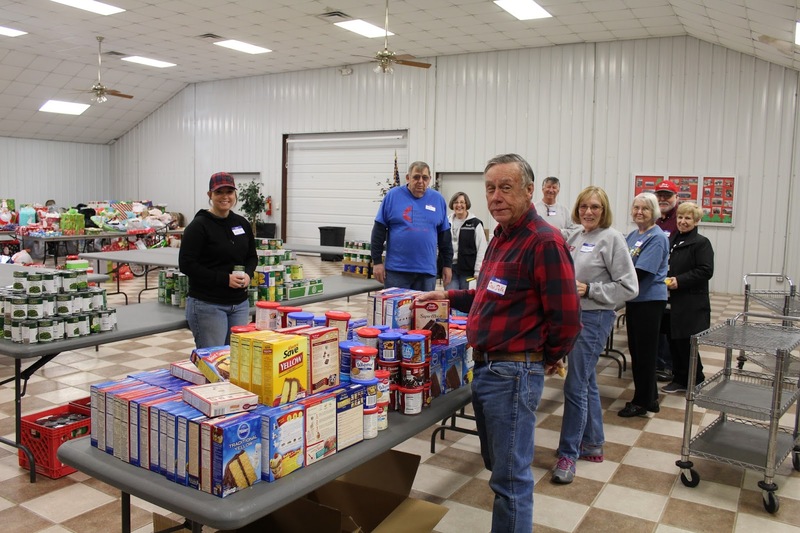 Volunteers with Catholic Charities in Sallisaw arranged gifts for 313 Christmas angels and food baskets for 200 families on Wednesday. The gifts and food baskets will be given away on Thursday. Arranging the gifts are, from the left (above, top) Judy Martens and Robin Akers, both with the Sallisaw Chamber of Commerce, and Ro Poindexter, volunteer who oversees the gift giving. 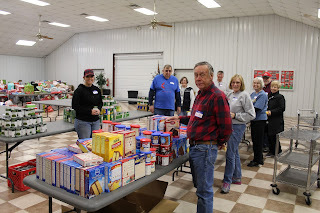 Arranging the foods (above, bottom) are volunteers from various Sallisaw churches, including Cheryl Lockwood, third from left, who organizes the food baskets. 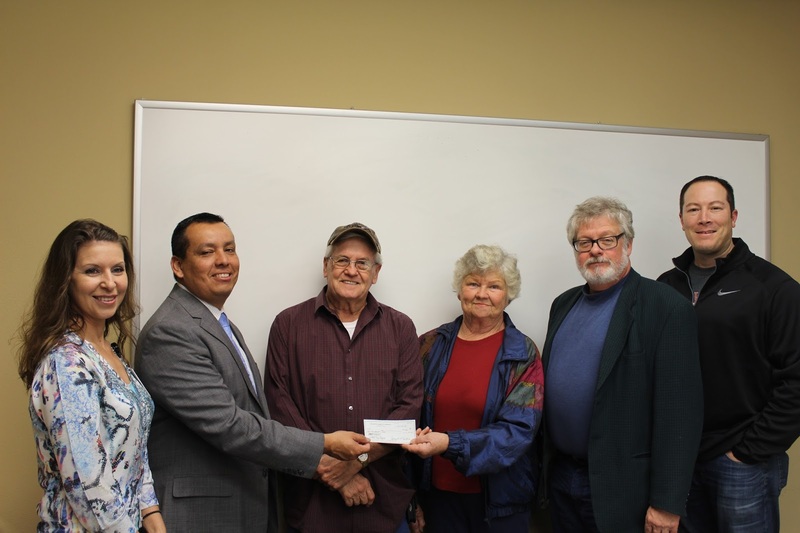 Both Christmas projects are done through the Catholic Charities Helping Center in Sallisaw with the assistance of the Sallisaw Pastors’ Fellowship. 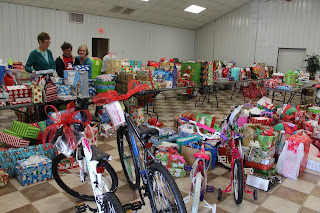 MaryLynn Lufkin, Catholic Charities Helping Center coordinator, said at one time the center organized Christmas Angel Tree gift giving for the entire county, but the project became overwhelming when over 700 angels were submitted to the project. The assistance of Pastors’ Fellowships and churches in other county towns was sought and those volunteers now organize their own angel tree and food basket projects. 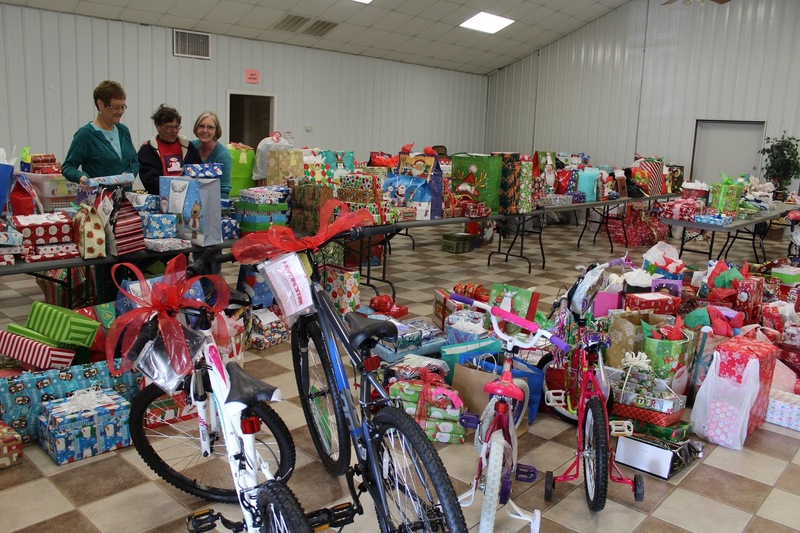 In Sallisaw the gifts and food baskets were arranged at the Sequoyah County Fairgrounds, and the gifts and food baskets will be given away on Thursday. Tom Stites, local businessman and community leader, has announced his candidacy for State Representative in House District 2. Stites, son of former House District 2 Rep. J.T. Stites II, holds a degree in engineering from Oklahoma State University and has served in the U.S. Air Force on both active duty and in the reserve. Stites has worked as an engineer for the Kohler Company, The Ben Hogan Company of Fort Worth and Nike, where he was the Director of Research and Product Development. As a businessman, Stites has built several successful companies from the ground up and plans to bring more business opportunities to Eastern Oklahoma. Stites currently works with product development at Tom Stites and Associates here in Sequoyah County. 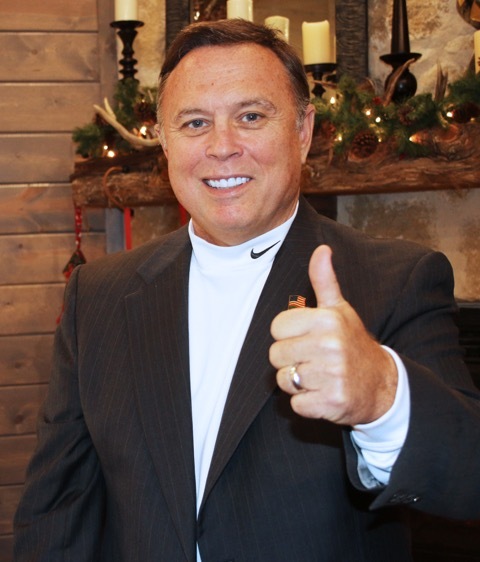 Stites is a Trustee for Carl Albert State College, a member of the Oklahoma Cattlemen’s Association, and a member of the Sallisaw Chamber of Commerce, where he serves on the Sallisaw Improvement Committee. Tom Stites and his wife, Nan, live in Sallisaw, and have four children and four grandchildren. They are active members of the Immanuel Baptist Church. House District 2 covers much of Sequoyah County and the cities of Sallisaw, Vian, Roland and Muldrow. 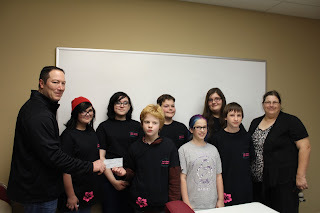 For more information about the campaign, visit tomstitesforok.com. Jackson Grocery and Meat Market won first place in the Business Division in Sallisaw’s Christmas Parade Saturday. 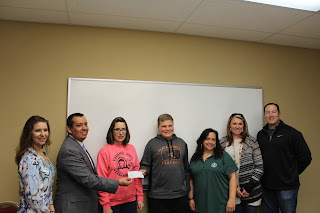 Presenting the first place $125 award is Bryan Warner of Sallisaw, Cherokee Nation Tribal Councilman for District 6, on the left, and Amber Nelson, marketing director at Cherokee Casino Sallisaw, right. Accepting are, from the left, Jeff Jackson, Alanna Jackson, Jennifer Jackson, and Chance Jackson. The Jackson’s float, an Old Country Store, also won first place in the Roland parade. The Cherokee Nation provided the money for the parade winners. The Jackson’s float won first place in the Business Division. 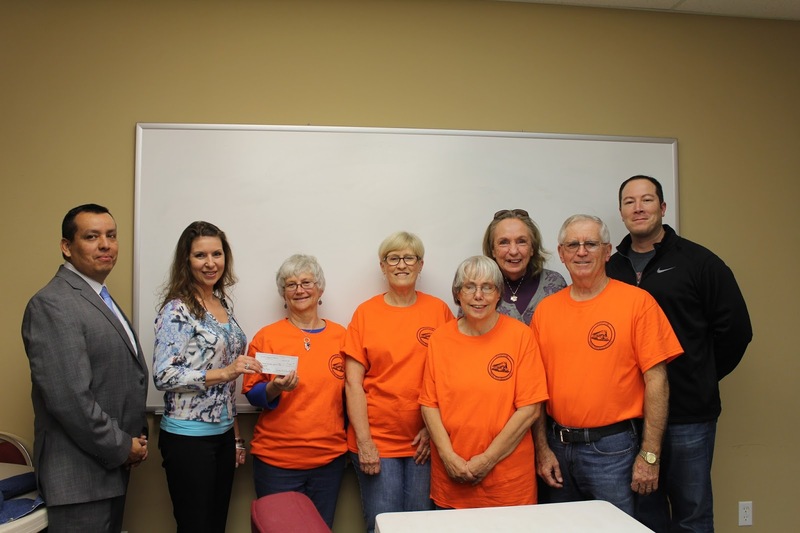 Friends of the Library at Stanley Tubbs Memorial Library in Sallisaw won first place in the Non-Profit/Churches Division in Sallisaw’s Christmas Parade Saturday. Presenting the first-place $125 check are, from the left, Rod Fourkiller, Cherokee Casino Sallisaw operations manager and Amber Nelson, the casinos marketing director. Accepting are, from Nelson’s left, Mary Stewart, Jane Cripps, Linda Copeland, Sally Maxwell, and Carrol Copeland. Bryan Warner of Sallisaw, Cherokee Nation Tribal Councilman, District 6, is on the right. The Cherokee Nation provided the awards for the parade. The Sallisaw Middle School Diamond Dazzlers won first place in the Schools Division in the Sallisaw Christmas Parade Saturday. Bryan Warner, left, of Sallisaw, Cherokee Nation Tribal Councilman for District 6, presents the $125 first-place check. Accepting are, from Warner’s left, Samantha Glover, Destiny Gaither, Xander Cox, Zeke Callahan, Morgan Morris, Lyddia Walters, Easton Robinson, and Annette Batemon, director. The City of Sallisaw Electric Department won first place in the Public Service Division of the Sallisaw Christmas Parade Saturday. 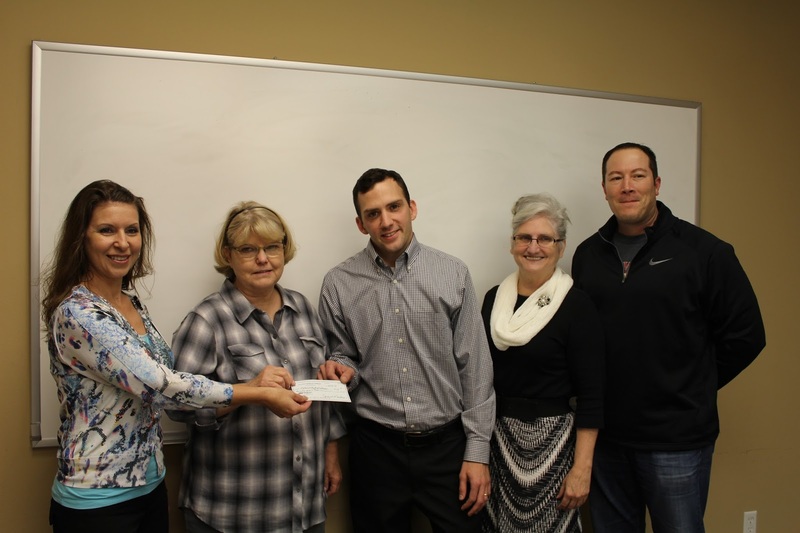 Presenting the first-place $125 check are, from the left, Rod Fourkiller, Cherokee Casino Sallisaw operations manager, and Amber Nelson, the casinos marketing director. Accepting are, from the left Steven Armstrong, Sheldon Caughman, Daniel Terrell, Austin Poindexter and Blakely Smith. Bryan Warner of Sallisaw, Cherokee Nation Tribal Councilman, District 6, is on the right. The Cherokee Nation provided the awards for the parade. National Bank of Sallisaw won third place in the Business Division in Sallisaw’s Christmas Parade Saturday. Presenting the $75 third-place award is Amber Nelson, the casinos marketing director, left, and Bryan Warner of Sallisaw, Cherokee Nation Tribal Councilman, District 6, right. Accepting from Nelson’s left, are Debbie Fleetwood, Ryan Roth and Susan Chandler. The Old Sallisaw High School Association won second place in the Non-Profit/Churches Division in the Sallisaw Christmas Parade Saturday. Presenting the second-place $100 award are Amber Nelson, Cherokee Casino Sallisaw marketing director, and Rod Fourkiller, Cherokee Casino Sallisaw operations manager, on the left, and Bryan Warner of Sallisaw, Cherokee Nation Tribal Councilman, District 6, right. Accepting are, from Fourkiller’s left, Bob Philpot, Jackie Snow Pop and Robert Jamison. Cub Scouts Pack 731 won second place in the School Division in the Sallisaw Christmas Parade Saturday. 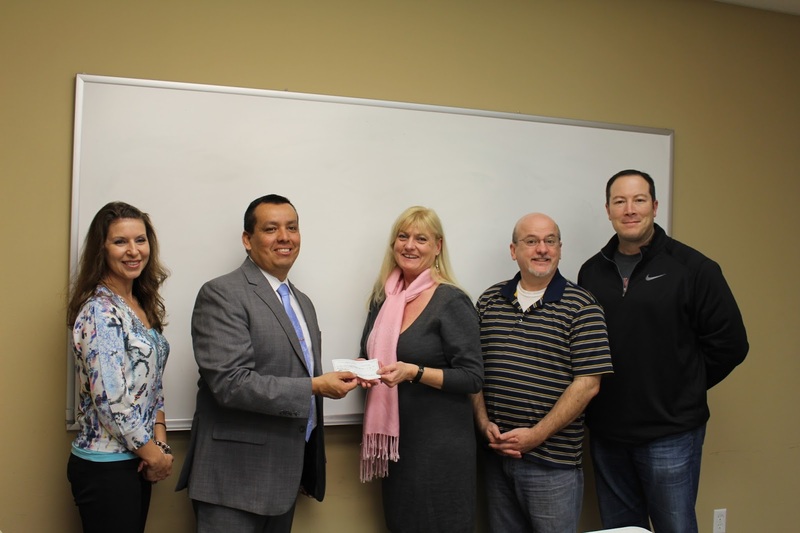 Presenting the $100 second-place award are Rod Fourkiller, Cherokee Casino Sallisaw operations manager, and Amber Nelson, the casinos marketing director, left, and Bryan Warner of Sallisaw, Cherokee Nation Tribal Councilman, District 6, right. Accepting are, from Nelson’s left, Brycen Gilje Devan Pigg, Mason Gilje, and Melissa Gilje, pack chairman. The Grand Marshals won second place the Public Service Division in Sallisaw’s Christmas Parade Saturday. At the award presentation are, from the left, Rod Fourkiller, Cherokee Casino Sallisaw operations manager; Sallisaw Fire Chief Anthony Armstrong; Amber Nelson, the casinos marketing director; Stanley Collins; Sallisaw Police Chief Terry Franklin; Bill Aydelott; Bryan Warner of Sallisaw, Cherokee Nation Tribal Councilman, District 6; and Sequoyah County Sheriff Ron Lockhart. The Cherokee Nation provided the awards for the parade. Trinity United Methodist Church in Muldrow won third place in the Non-Profit/Churches Division in Sallisaw’s Christmas Parade. Presenting the award are Amber Nelson, Cherokee Casino Sallisaw marketing director, and Rod Fourkiller, Cherokee Casino Sallisaw operations manager, on the left, and Bryan Warner of Sallisaw, Cherokee Nation Tribal Councilman, District 6, right. Accepting are Christina Clark and the Rev. Craig Clark. The Trinity float also won second in the Roland and Muldrow parades. The Sallisaw Police Family Float won third place in the Public Service Division in the Sallisaw Christmas Parade Saturday. Presenting the award are Amber Nelson, Cherokee Casino Sallisaw marketing director, and Rod Fourkiller, Cherokee Casino Sallisaw operations manager, on the left, and Bryan Warner of Sallisaw, Cherokee Nation Tribal Councilman, District 6, right. Accepting are, from the left, Colleen Franklin, Logan Oliver, Lisa Gabbert and Julie Oliver. 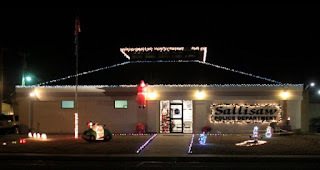 The Sallisaw Chamber of Commerce on Monday announced the winners of the Christmas Store Front Decorating Contest, in the Christmas Parade and in the Shop Sallisaw Cash Give-Away campaign. Phyllis Poindexter of Sallisaw had the $1,500 grand-prize winning ticket in the Shop Sallisaw campaign. A total of $6,000 was given away to shoppers with tickets on Saturday. Poindexter obtained her ticket at the Sequoyah County Times. Sallisaw West End: First Place – National Bank of Sallisaw; and Second Place – KXMX, The Mix 105.1. The top three places in each decorating division were awarded trophies. The winners in the Christmas parade received a trophy and $125 for first place, $100 for second place and $75 for third place. 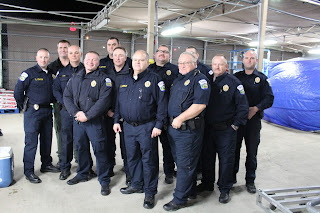 Public Service Division: First Place – City of Sallisaw Electric Department; Second Place – Grand Marshall’s Float; and Third Place - Sallisaw Police Family.